WeLoveFine gives you another way to carry your dice to your games with the release of their Beholder dice bag. You don't have to roll a D20 to score a critical hit with WeLoveFine. We've been dying to release the newest dice bag edition to all you table top gamers out there, and here it is: The Eye of the Beholder Dice Bag. This high quality, textured fabric bag features the original dungeon terror that has become so iconic to the world and players Dungeons & Dragons. 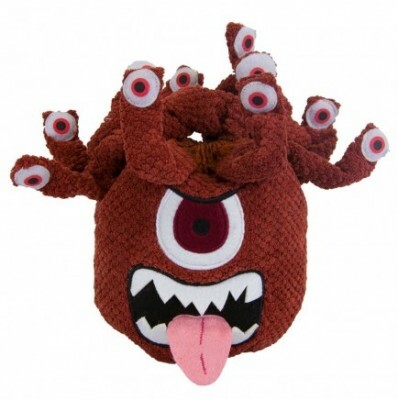 Pull on the eye stalks to open and close this monster dice bag, keeping your D20s, D10s, D4s, D12s, and mini figures safe and sound outside of your regularly scheduled gaming shenanigans. And don't think that this bag is only meant for gaming! This is a multi-use plush bag of holding that can be used to carry a variety of items from phones, small tech gadgets, and coins in addition to dice.